Valentine’s Day is the perfect day to pamper someone you really care about. What better way is there to do this than to serve them a romantic breakfast in bed? All you need to do is prepare a delicious meal, serve it on a beautiful tray, and light a few romantic candles to set the mood. Here are some of our favorite romantic breakfast choices. The nice thing about this baked French toast is that you can put the dish together the night before and then bake it in the morning. Simply follow the recipe from start to finish, but rather than put the baking dish in the oven, cover it with plastic wrap and store it in the refrigerator. When you wake up, all you need to do is heat the oven, remove the plastic wrap, and let it bake while you make the rest of the breakfast. Cook some bacon, make a pot of coffee, and cut up some fresh fruit and you’ll have all the things you’ll need for a romantic breakfast! Does your sweetheart love a good breakfast? If so, try making a fancier version of their favorites for Valentine’s Day breakfast! 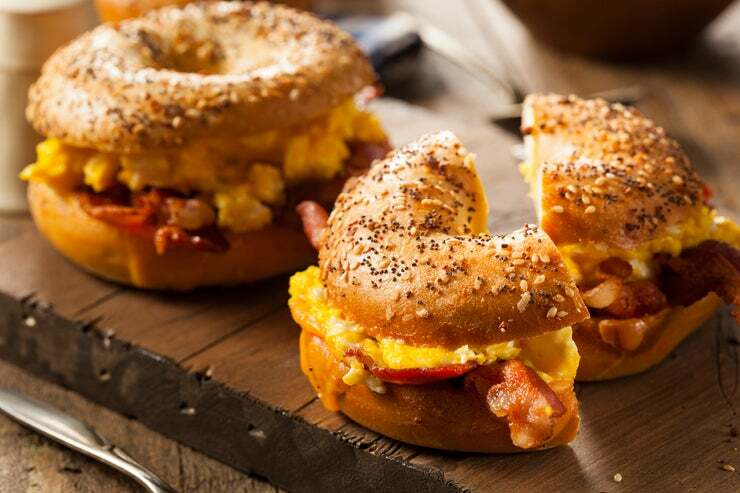 Simply topping a gourmet baked good (such as a delicious biscuit, bagel, croissant, or even a pancake) with items like bacon, sausage, eggs, and artisanal cheese can transform a simple breakfast into a delicious food worthy of the most romantic day of the year. These cheesecake parfaits are a great choice if you’re looking for a more decadent breakfast choice. If you’re a little uncomfortable with the idea of eating dessert for breakfast, substitute the cheesecake filling in the recipe for vanilla or cheesecake flavored yogurt and then prepare the parfait as usual. This will lighten the dish up considerably while still making it feel like a decadent treat. Do you want to serve something a little healthier for your Valentine’s Day breakfast? This citrus fruit salad will do the trick! In fact, you can either serve this delicious salad by itself or to accompany anything else you decide to serve for your romantic meal. Since this salad does include maple syrup, it tastes especially good with maple bacon and pancakes. Pizza is another great breakfast dish that you can serve. However, not just any old pizza will do. Try topping pizza dough with all your favorite breakfast toppings. Preheat the oven to 400 degrees Fahrenheit. Prepare the pizza crust as directed on the packaging and top with maple syrup. Follow that with uncooked bacon slices, scrambled eggs, and uncooked breakfast sausage. Sprinkle with your favorite melting cheese (such as cheddar) and an additional swirl of maple syrup. Bake until the cheese starts to bubble, which should take 10 – 15 minutes. These breakfast ideas are perfect for your romantic Valentine’s Day Gift of breakfast in bed!